I am trying to complete the random quote generator with vanilla js but i’m really stuck. Is a click event listener the correct way to go to get a working button for this? Seems so. I can see quotes in the console. You’ve already got the quotes in an array. Just move the code you have to randomly select one into your event handler and you’ll be able to get a new quote each time the button is clicked. It is, but presumably you’ll want the event to be bound to the button instead of the whole document. As already mentioned, make sure the function picks a new quote each time it’s run or it won’t look like it’s doing anything at all. You’re very close. To start, you don’t need the forEach call after you get the data. 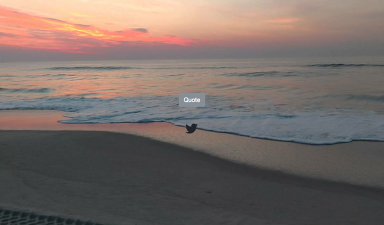 data is an array of quotes, and you only need one at a time. Keep that variable where it is and move all your other code out of the forEach method. Change your randomization code to select from your data instead of just one quote. My app does random video with random segments along with random audio and pictures. It can also play random groupings of text pics audio and video. The quotes to randomly play have a “break” record at beginning and end. I generate a random number that is between the beginning and end of the text file. I think i sort of almost have it, i just can’t seem to make my quote button work, Can anyone help, i feel like i’m really close but just can’t get this final piece in place and it’s driving me crazy?